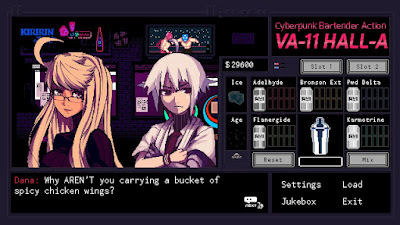 How weird is it that there are multiple cyberpunk bartending games out there? 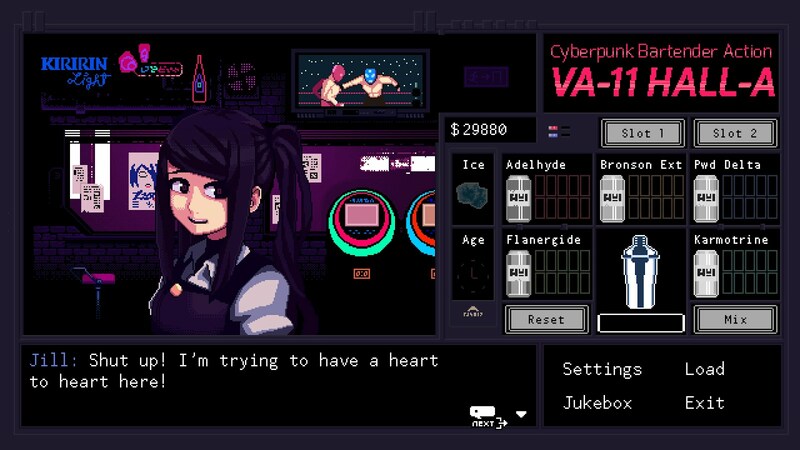 After the excellent Red Strings Club, I was looking forward to another spin on the, uh, genre, with VA-11 Hall-A: Cyberpunk Bartender Action. There are some surface similarities: both are dialogue-heavy, have a retro art style, feature strong transhumanist themes, and, y'know, involve mixing drinks for a parade of colorful futuristic patrons. 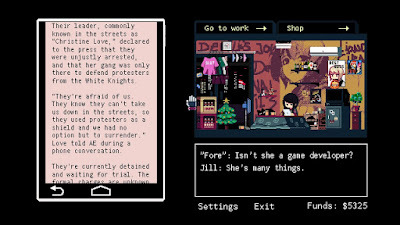 That said, the games ended up feeling very different: in tone, in gameplay, in message. 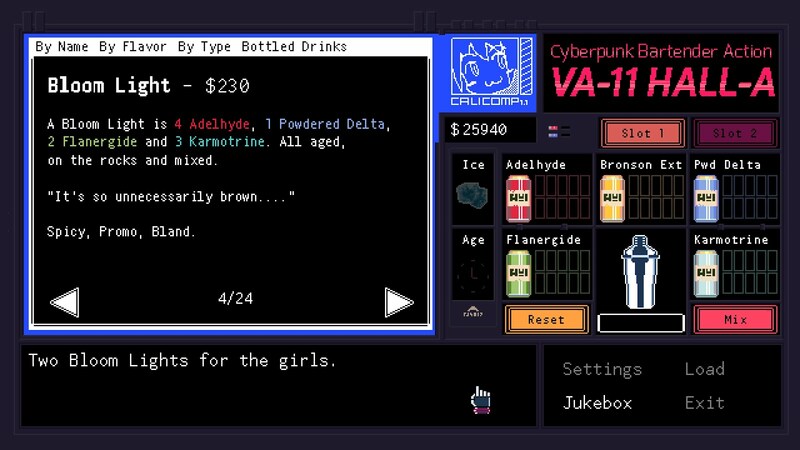 The Red Strings Club featured a surprisingly varied set of gameplay mechanics, from crafting with a lathe to drink-muddling to suspect-confronting to hacking and so on. Valhalla has a surprisingly limited (yet effective) mechanic: mixing drinks. That's basically it. Select the ingredients, optionally add ice or age, shake it up and serve. That's pretty much 95% of the game. 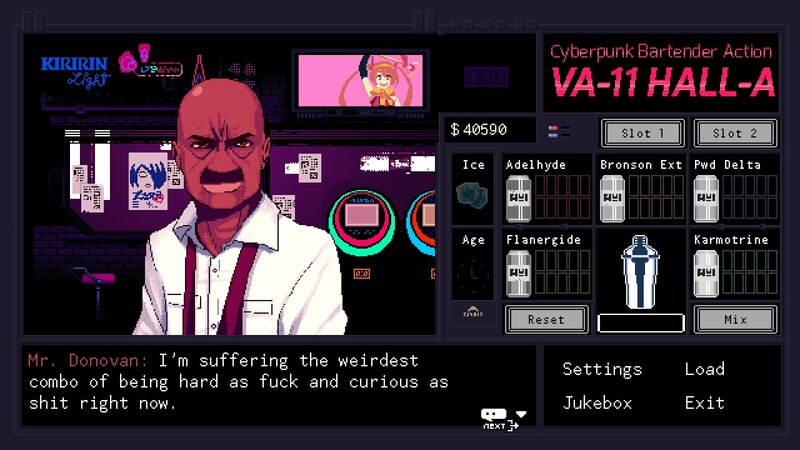 This is especially interesting given that this is such a dialogue-heavy game with a branching plot. While your main action is mixing drinks, the vast majority of your time in the game is spent reading dialogue, both of your own character and of your patrons and coworkers. For quite a while I kept expecting to get a traditional dialogue menu: say A or B in response to this statement? That never comes. Instead, the branches follow your actions. Serve someone a drink with extra alcohol? They might loosen up more and become more talkative, or fall asleep under the bar. Mess up their order? They might leave in a huff. Remember their favorite from last time? They'll grow more attached to you. 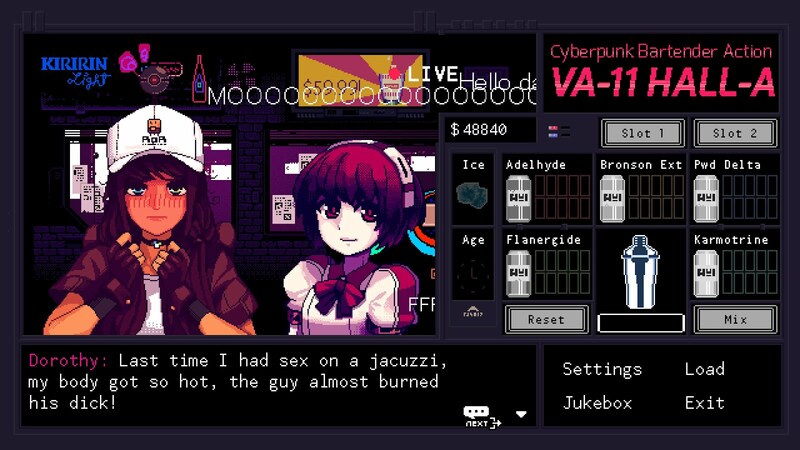 All along you'll keep talking to them: you can't adjust your character's attitude or voice, so Jill remains a very distinct character. And an incredibly likeable one, too! While others will periodically comment on how she seems cold or distant, you have the benefit of seeing her warm relationships with close friends, as well as her inner thoughts, and I grew very fond and protective of her over the course of the game. There are only a handful of non-bartending actions that I can think of. There are a couple of one-off mini-games, which are brief but fun, and give you the chance to interact with folks outside of your normal routine. The other big one is the Jukebox: at the start of each shift, you load up the songs to play. At first glance this is entirely superfluous - who cares about the music? - but it becomes super-interesting. The tone of a conversation can change drastically depending on what kind of music is playing behind it: the words might be exactly the same, but you'll pick up a different vibe depending on whether the music is aggressive, melancholy, playful, triumphant, or whatever. And it's all random! I'm left thinking that I may come away with a pretty different impression of the game's story and its characters based on when the tunes I selected happened to be playing, versus someone else who did everything the exact same time but ordered their songs differently (or even read significantly faster or slower than me, causing the music to drift over different conversations). It would be interesting to hear the game "scored" by someone who knew in advance which conversations were coming up and selected songs accordingly. I'm also left wondering how other video games might turn out differently just by changing their music and keeping everything else exactly the same; I'm reminded of those awesome movie trailer edits that drastically change the impression of a movie by just changing the sound. Anyways: I'd cycled through the jukebox dutifully, going forwards and then back each time I could select songs, but eventually realized that I was landing on the same ones over and over. I finally started to mix it up more near the end and heard quite a few tracks that had never come up before. If I were to do it over again, I'd probably either keep a single playlist up until it had played all the way through and looped back, or else make use of the "Shuffle" feature to give more variety. You can't lose the game, only get different endings, so don't stress too much. But you can get different / better outcomes, so it's worth paying attention. Money is tighter than you think. Don't waste it on stuff you don't need. Exception: It's worth buying the Tea very early on. The "Flawless Service" bonus is pretty much essential if you want to avoid distraction and pay all of your bills. You might be able to miss one or two days' bonus, but not more than that. On the rare occasions when you have free reign to pour any drink, it's worth leaning towards higher-priced ones. Remember that the Bottled drinks are all $500. But at the end of the day, your commission on drinks will always be pretty small. Tips and bonuses are far more important. Pay attention whenever people are talking about drinks: what they enjoy, why they enjoy it, stories they've heard about drinks. Most of that information will come in useful later. Clicking the plus sign in the top left of the title screen lets you play the "Prologue" and "Anna". These are chronologically set before the start of the game. I think it's probably slightly better to play them after the end, since they don't include any of the tutorial information of the main game. You can't save while playing these and the progress isn't tracked, so you can do them at any time to get a more detailed look at events that are referenced during the game. I think it took me about a week to play through the game, usually playing for about 1-2 in-game days per real-world day. That seems like a good cadence, as recent events would stay fresh in my mind. You could definitely "binge" this in a more compressed session, which would probably make it easier to remember special drink preferences. 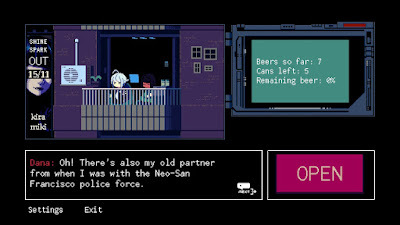 Besides Red Strings Club, the other game I thought about a lot was Read Only Memories. 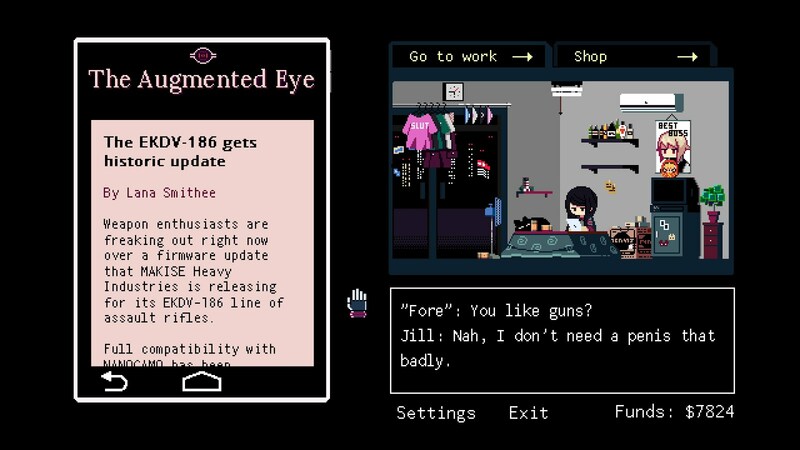 I had to double-check that this game is from a different developer, because there are so many references to that game here. 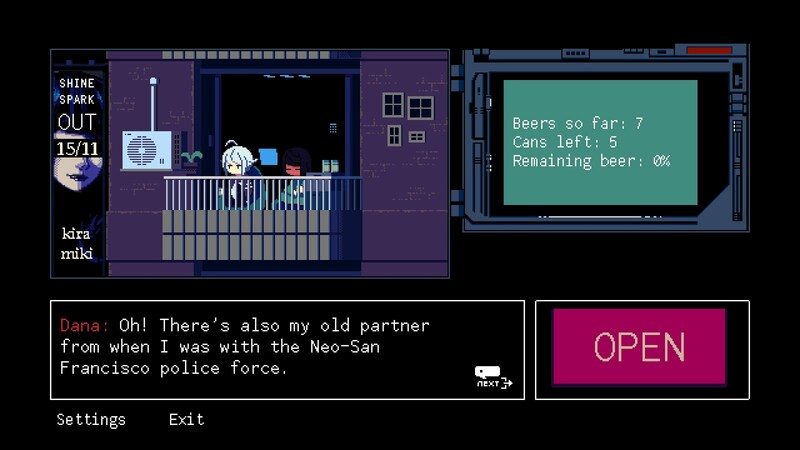 Hassy ads pop up multiple times, there's a Robot Turing toy, and your boss Dana has a long story about her time on the Neo-SF police force, and I'm like 80% sure that the partner she describes is a character in ROM. I'm curious if the two games shared common personnel, or if it was more of a love letter or homage to the other game. Likewise, it was really fun to see Christine Love show up as an unseen but significant character in this game. It felt kind of like a Kickstarter backer reward sort of thing, though I didn't see anything in the credits related to crowdfunding, so that also may have been an homage. 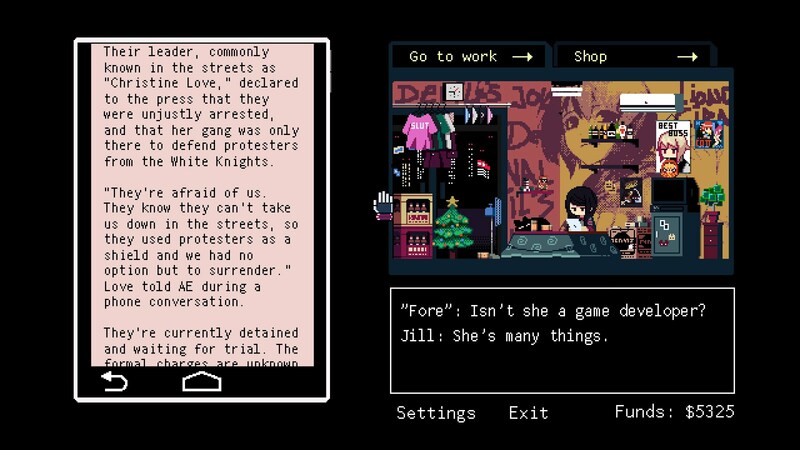 One thing all these games have in common is positive portrayal of LGBTQ characters, with those portrayals ranging from the sympathetic to the exuberant. Valhalla seems more... relaxed, maybe, than other games in this space. There's a wide range of orientations and identities on offer, but they tend to be secondary attributes of the characters, unlike ROM, where those identities seemed central. Jill is mostly interested in women, but had boyfriends while growing up and has some preferences when it comes to men. Jill carries a torch for Alma, who is frustratingly straight. Jill's ex-girlfriend Lenore was only ever interested in women. Same with Betty. Dorothy likes everyone. 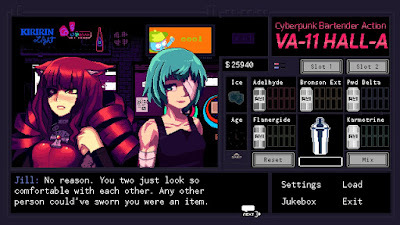 There's a fair amount of transhumanism in this game, which is most obvious with phenomena like "cat boomers" such as Stella who have received genetic and cybernetic enhancements, but seems widespread enough to be almost mundane: Dana has a metal arm, and Alma has metal hands, and neither of them think about it much at all. The game is more interested in artificial intelligence and the possibility of created beings becoming compatible with humanity. Here, that is mostly explored through "Lilim", essentially androids who freely move among humans, carrying on their own jobs and passions, somewhat like but not the same as people. For the most part this is all very cool. The character of Dorothy can be a bit unsettling: on her own terms she is fun and sweet and exuberant, but it's pretty jarring to connect her physical appearance with the acts she performs. I think this is getting at something we as a society will be dealing with in a couple of generations: when behaviors and relationships between certain people are negative, if those same relationships can be acted out virtually and without harming others, do they become okay? It feels like the game is saying "Yes," though I might be reading too much into it. Apart from Dorothy, the other character who gave me serious reservations was Donovan. It's a bit... odd that there's just a single person of color in the game, and he's hands-down the most detestable: threatening, condescending, leering, predatory, conniving. I don't think this is intentional, but it still kind of bothered me. 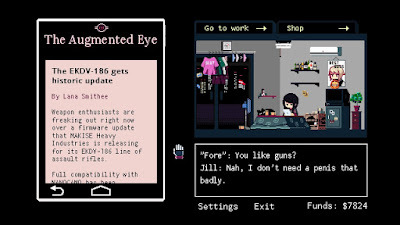 On the other hand, it's interesting that the game front-loads your least pleasant customers. Right off the bat you're serving Donovan and the worst iteration of Ingram, and the game seems kind of dire. As the days go on, though, you spend time with old friends (Alma), friendly customers (Becky and Deal), and sweet new clients (Kira*Mika, Sei, Stella). I thought that was a bold choice. 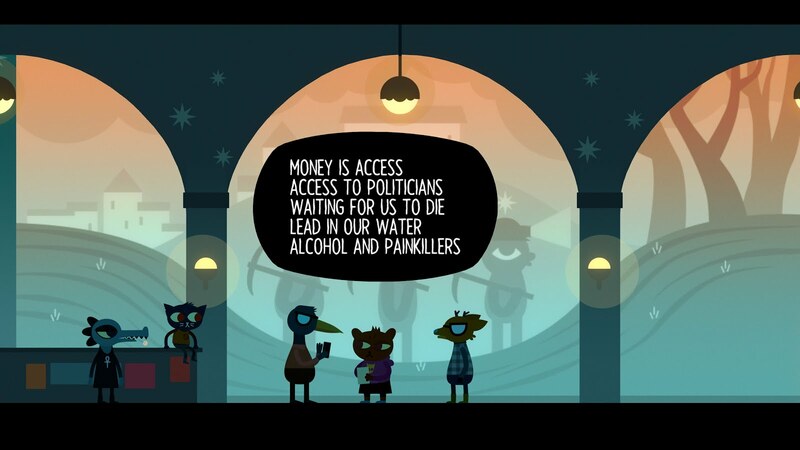 I would naively think that you would want to welcome people into a game like this with the most fun and pleasant people, and then progress on to the harder customers after you have the ropes down. On further reflection, though, setting the bar low is probably a better design. You come to really appreciate the good customers later, after getting your expectations set so low, in a way you might not if folks were nice to begin with. For the most part, though, I really liked everyone in the game and got very invested in their relationships. It seems like there are multiple endings; I got the "Alma" ending, though in retrospect I kind of wish I'd aimed for Sei instead. The game ends on a much deeper emotional level than I'd expected, dealing with grief and healing and nurturing. I'd kinda hoped for some kissing, but this is good, too! I'd come to care a lot for Jill over the course of the game, and I feel good about her future after all she's done at the end. Another really fun indie game for the books! It looks like there's already a sequel planned, N1RV ANN-A, which I'll definitely keep an eye open for. I'm impressed at how they managed to make such a strong story-focused game without any of the ordinary interfaces of an adventure game or visual novel or other conventional structure, and am looking forward to returning to this world and sensibility in the future. 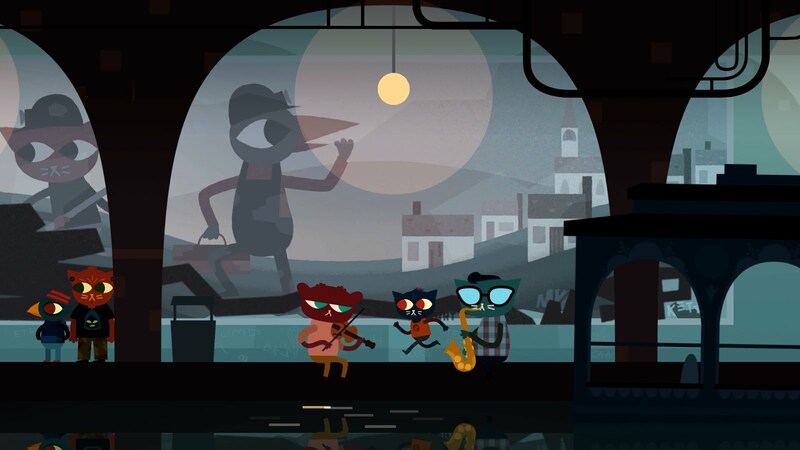 Night in the Woods is one of the rare games that I've both been looking forward to playing and know almost nothing about. It isn't a sequel or from a familiar developer or based on an existing story. But it's frequently been mentioned alongside a variety of games that I know and dearly love, so I treated it with reverence, studiously avoiding spoilers or, really, any information at all. In retrospect, I probably didn't need to be that paranoid. It isn't a particularly twisty game, and would probably still be as enjoyable if you went in knowing the characters and overall plot. Regardless, it's always nice to go into something cold and have it delight you. From the minuscule amount of information I'd gleaned prior to playing, I'd vaguely thought that it would be similar to Oxenfree: following a group of young people revisiting a familiar place, encountering unusual phenomena, solving puzzles. However, it ended up being a lot more like Life Is Strange, oddly crossed with Dex. 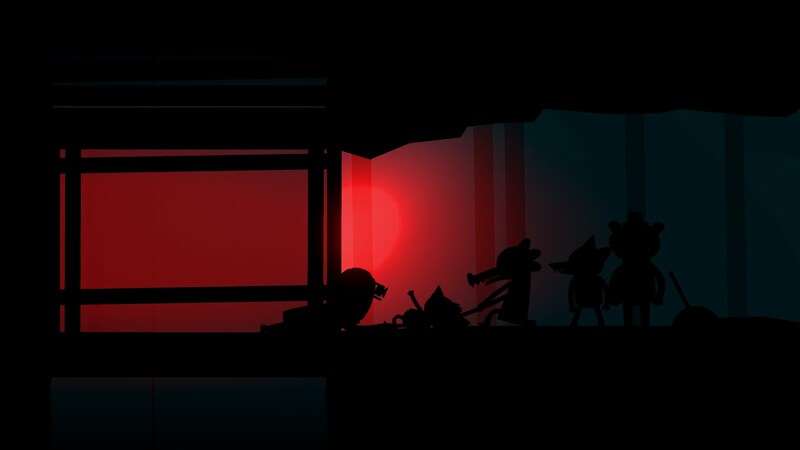 It has a marvelously relaxing structure for most of the game: you don't feel rushed, and can spend your time wandering the environments, chatting with friends and strangers, looking for hidden things in nooks and crannies. It focuses on relationships, both rekindling older ones from your childhood and forging new ones. It handles some of the same themes as Life Is Strange, treating serious topics with respect, albeit with much more humor. The actual gameplay feels surprisingly similar to Dex, a side-scrolling cyberpunk game I enjoyed recently. Both are prominently focused around city navigation, which is primarily side-to-side but with some interesting wrinkles that keep it from feeling too flat. Both make great use of vertical space and movement, Night in the Woods even more so, opening up entirely new vistas as you learn how to climb to the rooftops. 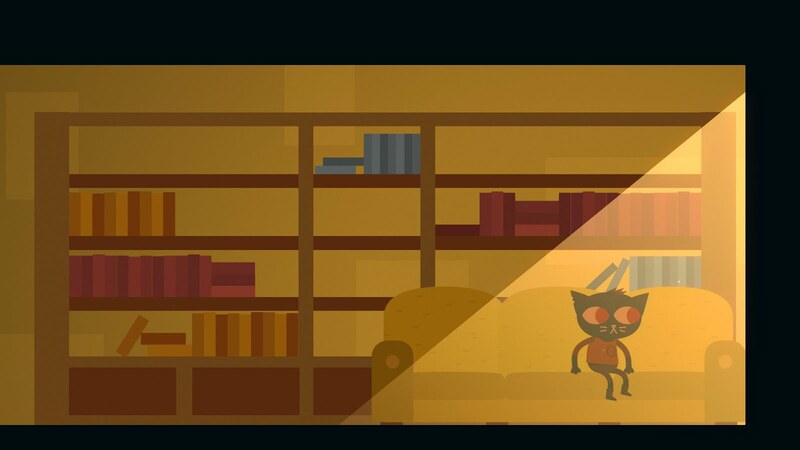 They use parallax to great effect, giving a nicely 3D feel while keeping simple 2D controls intact. Dex has some fun hidden secrets you can find via exploration, and Night In The Woods has a lot more, which can easily become the main activity in the game. I guess the dialogue is kind of similar too. 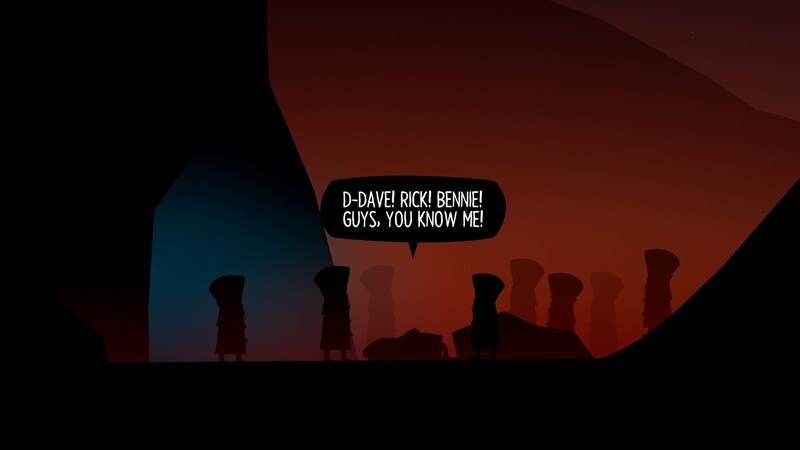 It doesn't use the real-time system like Oxenfree, but more of a conventional system where your character automatically speaks most lines, and occasionally pauses for you to select a response. Where Dex and Life Is Strange both had menus of responses, though, Night in the Woods usually only has two choices. Most dialogue choices don't lead to significant branching plots; there are branching plots, but those are more due to actions you take than the lines you say. 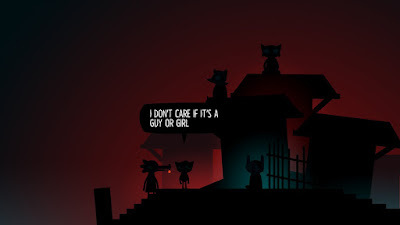 The protagonist Mae has a very well-defined personality and backstory, so roleplaying isn't exactly a huge part of the game, but it's still great to tune her responses to various situations. One thing that's a little unclear is when a dialogue choice will have a big impact. 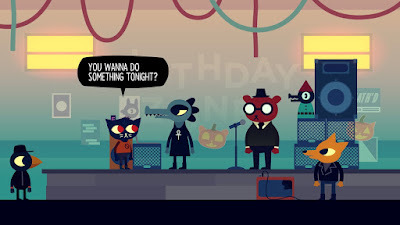 Most of the game follows a fairly similar pattern where you wake up, explore the town, chat with friends, and end up doing something that night with one of them. (Which, now that I think about it, is actually really similar to the old "School Simulator" games I used to make back in the day.) Anyways, sometimes when a friend asks "You wanna hang out?" and you say "Yes" it ends all your activities for the day, and other times it means you do something together during the day but can keep on planning. It's definitely not a huge deal. You can't lose the game, and since you have multiple days to do things you can even finish optional side-content that you were planning on doing that day. I think it's actually written pretty well, as I can usually tell in retrospect that "Oh, yeah, I should have known that would happen". Just something to potentially keep in mind. If you were to just beeline for those conversations and end the days, you could finish the game very quickly. It would probably still be fun, but I absolutely loved the vast array of stuff to do. Most of these are fun in and of themselves, again like Life Is Strange. You get more insight into characters, both your close friends and the background people who make up the town. And you learn more about the town itself: its history of mining, manufacturing, and labor strife; its crumbling local businesses and the efforts of the chamber of commerce to turn things around; what people do for fun and where they go and what they want to happen. And there are lots of nice little mementos to unlock: you have a journal, and add cool little doodles and notes as you find and do things, and occasionally earn a Steam achievement for accomplishing something off the beaten path. 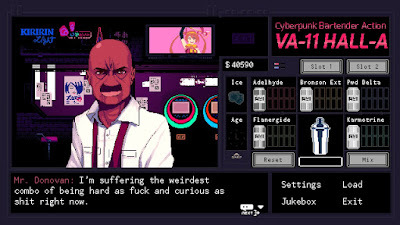 It's also totally worth doing stuff just for the dialogue itself. It's so, so wonderful. I was going to say that it's natural, but it isn't in the same way that, say, Oxenfree is. It's maybe a little heightened, hilarious, clever, profane, alternating between delightful stupidity and running in-jokes and really elaborate metaphors and associations. The personalities in the game are so strong and vivid. Late in the game there are some scenes that take place in total darkness, where you can just see the words being spoken, not who is speaking them, and you can immediately tell who is delivering each line: the vocabulary, the cadence, the style, have been so brilliantly and consistently defined that they are instantly identifiable. And those personalities carry through to the art as well, whether Gregg's adorably spazzy arms or Bea's perpetually downcast eyes. I love these people so much. Starting to dip into the actual plot somewhat... yet another aspect of the game that I enjoyed and that reminded me a bit of Life Is Strange was its really nice portrayal of religion. Like Max, Mae isn't exactly a believer, but she's close to people who are, and they are treated respectfully and their faith is portrayed positively, as a source of comfort and strength. 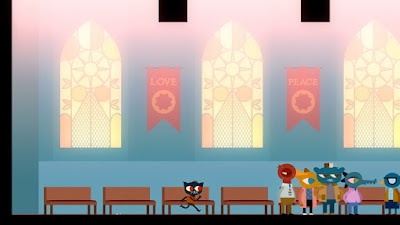 I especially liked how Mae's mom works for the church, and seeing how their family life intersected with the church felt very true to my own experiences in a similar family. The church is a spiritual place, but it's also a workplace, a very human place. I felt particularly strong nostalgia for the church library, a sort of sanctuary within a sanctuary, a calm refuge filled with books and peace. Like so much of the game, the church isn't a core element of Night in the Woods; I'm pretty sure that you could complete the entire game without even laying eyes on the church, let alone going inside or chatting with the great pastor (who reminds me a lot of my Aunt Fran). But it's a key institution in Possum Springs, a respected moral voice speaking up and caring for the poor and disadvantaged people on the fringes of society. 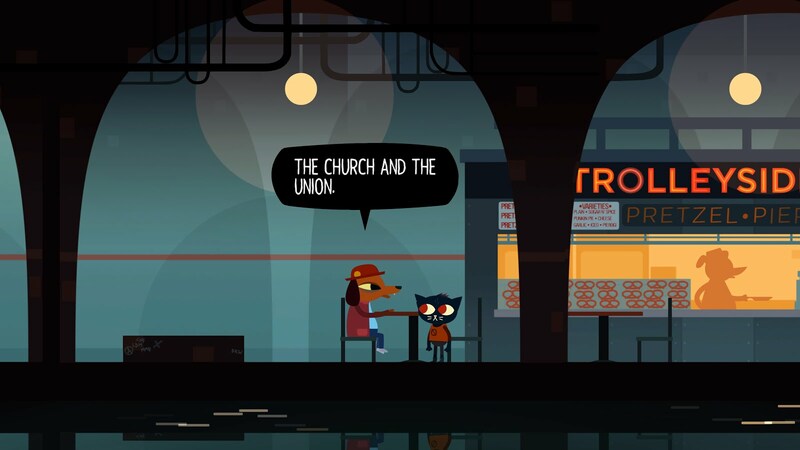 In another part of the game, you chat with an old-timer who grew up with your grandfather, and she reminisces about how the church was one of several pillars of the community, along with the union hall. There's a really cool and strong economic message that builds throughout the whole game, starting off as a kind of vague and generic nostalgia for "the good old days" and morphs into a surprisingly explicit call for leftist mass action. 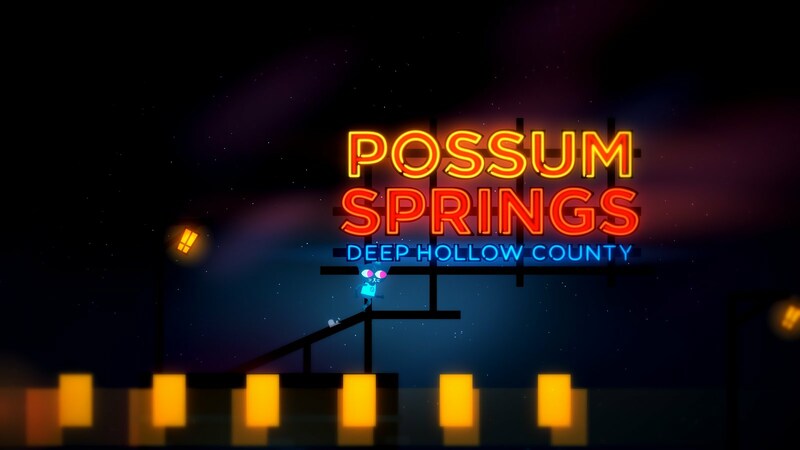 The original founders of Possum Springs lived dangerous and dirty existences, risking their lives in the mines for the benefit of the greedy bosses, and they formed the unions and fought for a better lot in life. This resonated really strongly for me having recently read Strike! and similar books over the past year, and I was swept up again in the history of bold labor movements of the 19th century. From the very start of the game, there's a consistent focus on the economic situation in Possum Springs and how that's affecting the local culture. There's plenty of "economic anxiety" to go around: like many rural towns around America, Possum Springs seems to be shriveling up. Once-grand stores have been shuttered, vacant businesses line the downtown, people who were once proud to work a union job in a factory are now bagging groceries or forced to live on charity. Near the end your father gets at the part that pains him the most: even more than the loss of high(er) wages, there's a lack of respect, on the part of the bosses and those who still wield influence. There's still great pride and culture in Possum Springs, but people are worried for the next generation: young people don't see any good opportunities locally and are leaving for big cities, forever. Those who remain feel a variety of emotions, from resignation to bitterness to fury. Selmers stunned me with her amazing poem: "some night i will catch / a bus out to / the west coast / and burn their silicon city / to the ground". The game is also very modern in its matter-of-fact handling of orientation and identity. Gregg and Angus are an absolutely adorable couple, high-school sweethearts now making a life together, well-liked by all. Well, almost all. Late in the game Bea shares her harsh-but-realistic take on the couple: Angus can do a lot better than Gregg, and sooner or later he'll realize that. But it's the same sort of criticism that would apply to any small-town 20-year-old pair. 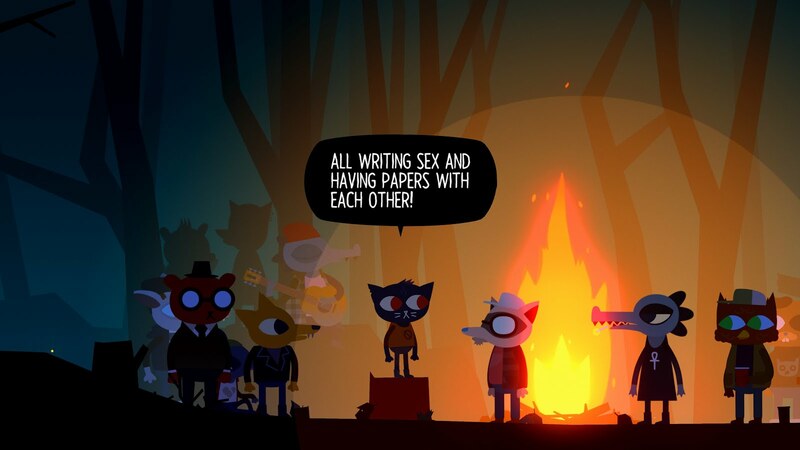 I'd kind of shipped Mae and Bea for most of the game, but Bea seems pretty clearly straight. 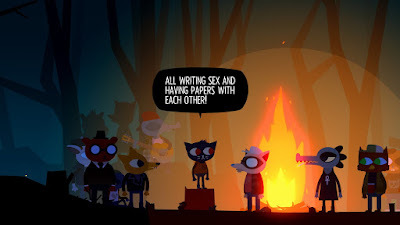 Mae, though... 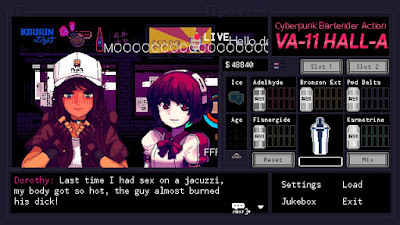 I absolutely loved the party scene where she discovers how much she loves to dance and flirts with that occult college girl. The game never pins down her sexuality, and never asks you to define it either: she's just a girl who really wants to wrestle people and talk about their feelings. I got to know Bea really well over the course of the game, while Angus remained mostly a mystery. I really liked how the game seems to reward you for focusing on the people you care most about: when you spend more time with them, you learn more about them and they open up more to you and you build a stronger relationship. 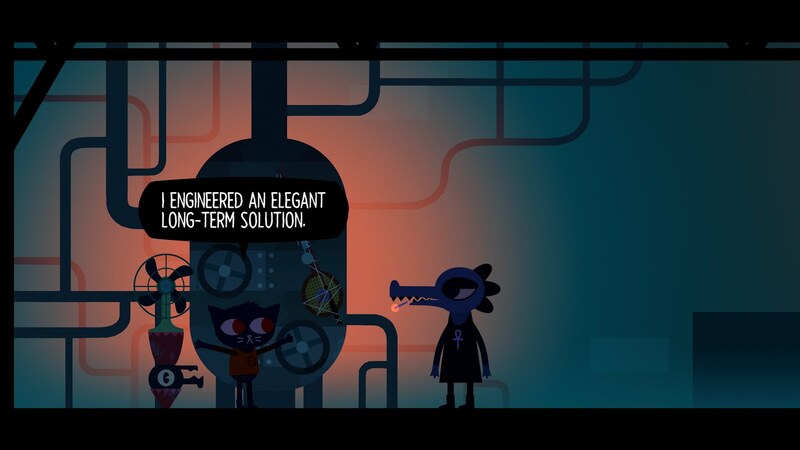 It's the opposite of how most games seem to be structured, where you have a perverse incentive to save the stuff you care about the most until the end and do the less interesting things first. Here, I'm pretty sure that I missed out on Angus's whole mission by putting it off for so long, and I'm guessing that I might not have spent that night in the city with Bea if I'd waited too long. Anyways... I sometimes get bummed by knowing that I missed out on some content, but I absolutely loved it here, since it was the direct consequence of what I cared about and how I spent my time. So, the big question: just who were the people in the Death Cult of Conservative Uncles? 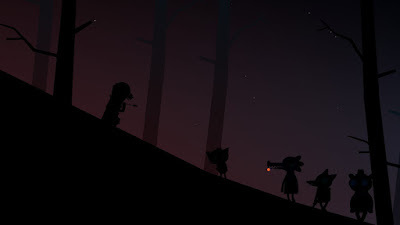 They're definitely individuals within Possum Springs, but are they people we've actually met in the daytime, and if so, who? During that scene in the mine I'd speculated a bit based on the attitudes they articulated: perhaps your cranky neighbor, or the stoop-sitter near Selmers, or someone on the Chamber of Commerce? But they're still around the following day, so I guess not. (Or perhaps they were able to escape?) 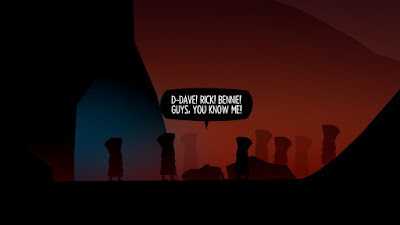 It's interesting to think that, for example, the gravedigger really could have been the ghost after all, reconciling the apparent conflict between your and Bea's theories. It feels like a solvable mystery. The people have such distinctive voices, I feel like you could probably match those words against other voices in town and find some matches. I'm also left wondering what they look like under their robes. When you see them all gathered together, everyone looks so uniform, but Possum Springs is so unique, with distinct profiles for cats, alligators, birds, bears, and so on. I'm curious if the cult is drawn exclusively from one particular species of animal, or if the robes are deliberately concealing their varied body types beneath. 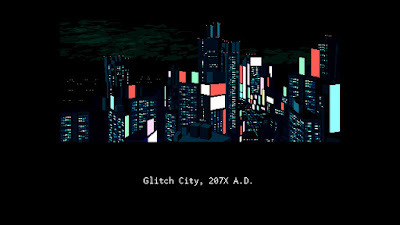 Or it could just be an art aesthetic thing that the game designers liked and I might be reading way too much into it. I'm still mulling over and cheering on the Big Reveal at the end. It is so cool and so hard to thread that needle between the supernatural and the realistic, and it feels really disappointing when stories mess it up, and frustrating when they sidestep it after establishing that tension. This was just a huge tour de force, and I was reminded a bit of, say, David Mitchell's climactic metaphysics unveiled in The Bone Clocks, revealing a detailed system and purpose behind decades of foreshadowing. I adore it when a work goes on record and goes: yep, there is something supernatural going on, and this is how and why and with who. The whiplash made it all the more fun: you're in a dreamlike state and see the ghost and are convinced it's all real. Then Gregg shoots it with a crossbow and the ghost yells and swears and runs away: the mystique is broken, reality re-established. And then you find what's beneath it all, and the awe grows even larger. The cult members are all mortal, even mundane, regardless of what they serve. That said, though.... if you look closely, you see that that one particular "ghost" does have a bit of a fading effect on his sprite; he's slightly shimmering into the background in the cave, even while the rest of the "ghosts" are firmly opaque. And it does seem like he's flying at the end when he comes up out of the mine shaft. Could he be possessed by the spirit in the well? There seems to be some precedent for this; we've learned that the cult's founder could walk through walls, so perhaps this one has been "chosen" in some way to carry out the spirit's will. But that's also odd, since it seems like the spirit wants you as a disciple, and doesn't want you to be hurt, so why would it support one who intended harm for you? I dunno. And I suspect that this particular mystery will remain unknowable. Among other things, the big reveal seems to give some forgiveness to Mae and her history: she wasn't crazy, or wasn't just crazy. This is another area (the last one, I promise!) where NitW seems to dovetail with LiS: both games address mental health in honest, serious, and respectful ways. 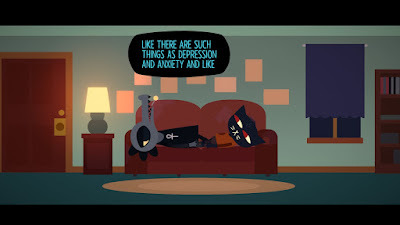 In the end, though, Night in the Woods is both more detailed (Bea diagnoses Gregg, seemingly accurately, with bipolar tendencies) and maybe a bit more optimistic. Depending on how you play Life Is Strange, mental health might seem like a difficult-but-manageable challenge or an insurmountable obstacle. 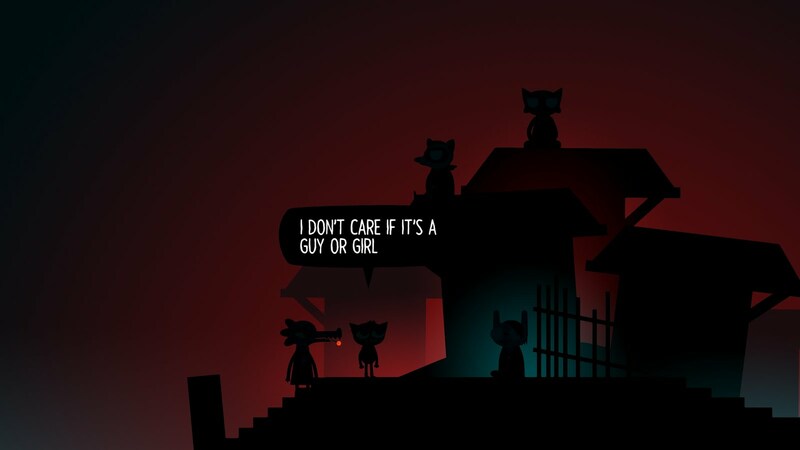 Night in the Woods closes on some really sweet messages, though. 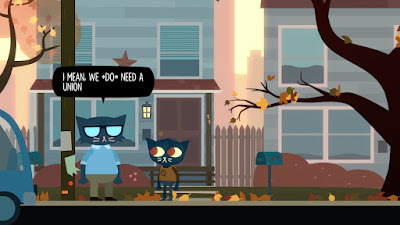 I teared up a little when Bea tells Mae something like, "I can help you find someone who can help you." I've never heard that before, and I'm definitely filing it away for future reference. There are ways to support others without becoming responsible for them, and help is out there: even if you've run into your own Dr. Hank, there are better options, you just need to find them. 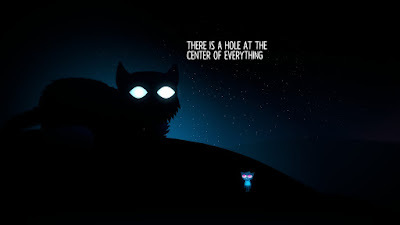 I liked this game a lot! 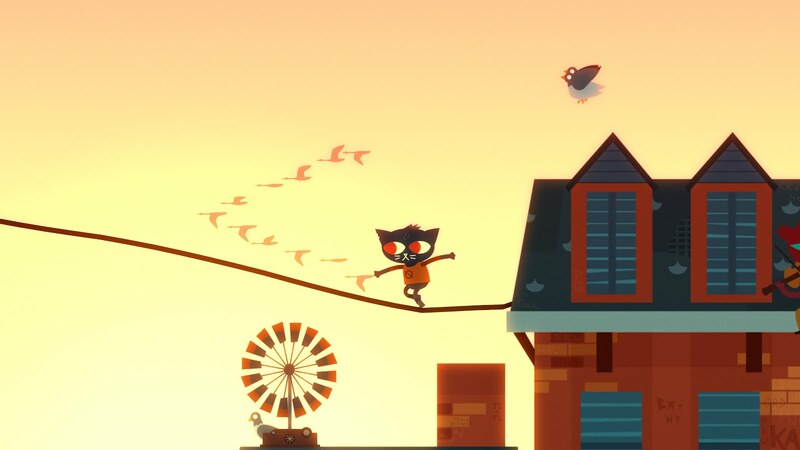 It may end up being one of the rare indie games that I replay some day: now that I know how to make all of the jumps, I want to explore more of the town during the early days; and I want to spend more time with different people and learn more of their own stories. It's a lot of fun to play, and can also feel really important in the topics it handles and the weight it gives to them. And I haven't even talked at all about the wonderful music, or the wonderful way Mae's eyes swivel up to watch Beatrice on the porch, or the beautiful stars, or the rat babies, or.... well, there's a lot. And still more to find! Judging by the concept art unlocks, I still have about half (!) of the secrets left to find. I do feel satisfied by the game I've played and the story I've heard, and I'm glad to have the option to head back for even more. Like a delivery pizza, this game is good as hell. 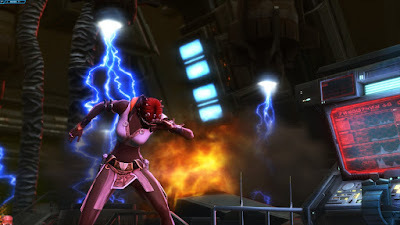 I've finally finished a major chunk of brand-"new" (post-launch) content for Star Wars: The Old Republic. 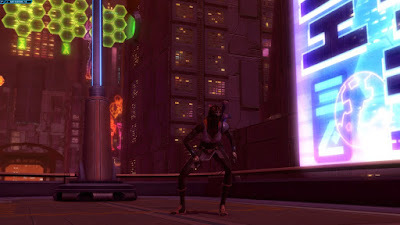 This post covers Trel'ves's progress through the Rise of the Hutt Cartel expansion, including the various side-quests and other content associated with it, up through the Prelude to Shadow of Revan. This game is made by BioWare, which means it's published by EA, which means it is infuriatingly difficult to take in-game screenshots. It actually has a dedicated screenshot key, but it seems to only work about 4% of the time, and never during cut-scenes, which are the ones I actually want to capture. There's no in-game feedback, so it isn't until after I finish, say, a 1-hour session that I'll open up the official Screenshots folder and find that it holds only 2 pictures instead of the 40+ I expected. I've come to discover that the best way to run EA games is through Steam, which is dumb but at least lets me use Steam's infinitely more reliable and convenient screenshot capture utility. At first, though, this didn't work for me: I wasn't able to access the Steam Overlay or any associated utilities even after adding SWTOR to my library and opening from there. After some digging, I eventually discovered that this was because SWTOR requires you to run in administrator mode, which is also why you get that annoying permission prompt each and every time you open it. (Why does it require Administrator Mode? Excellent question! And one that nobody seems to know the answer to! The official answer, dating back to the 2011 launch, is that it's because the game needs to be able to patch itself. But that seems incredibly wrong to me. I mean, Steam itself is self-patching, and can run in user mode; Lord of the Rings Online is self-patching, and can run in user mode.) The solution? 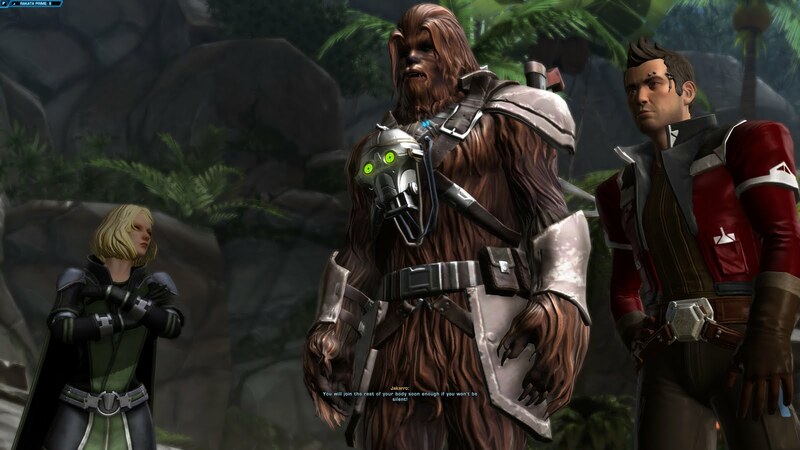 Launch Steam in administrator mode, then open SWTOR from within Steam. And finally! Screenshots! This was also the first time I've subscribed to the game since my original run in the pre-Free-to-Play days, and I thought I'd note what that experience looks like now. No credit limit. You'll receive all credits currently in escrow, and can accumulate and spend unlimited in-game money. Removes weekly limit on Space Missions. You can fly as much as you like. 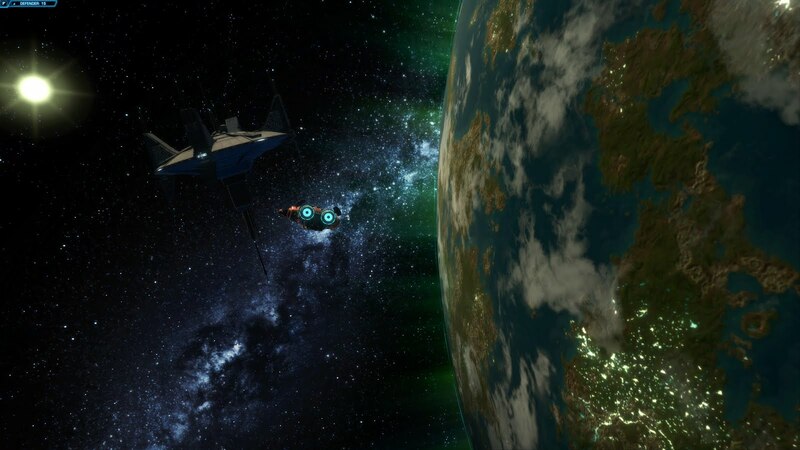 Unlimited crew skills and simultaneous crew missions. Free and unlimited Medical Probes (revivals after dying in combat). But it's still really good! The credit limit thing is particularly nice; there are quite a few Legacy unlocks that cost more than the 350k non-subscriber credit limit, as well as a few pricey items like certain housing and speeders, as well as Galactic Trade Network auctions. I'd previously thought that all that stuff would be out-of-bounds for a non-subscriber, but now it looks to me like every couple of months you could use one of those codes, do all your shopping with the credits you've accumulated during that time, then lapse without ever subscribing. If you do subscribe within 14 days of using the code, your referrer gets a benefit (probably Cartel Coins?). That's a 7-day grace period after the end of psuedo-subscriber status. 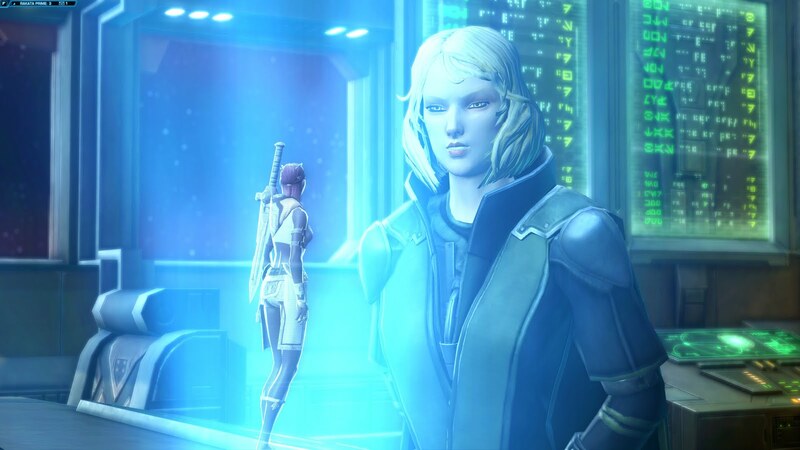 There are tons of codes out there; I used one from Swtorista, who has created some really great non-spoilery guides for solo players that have helped me out during my run. When you do subscribe, the best thing is probably to set up a monthly recurring subscription, then immediately cancel it. This gives you all the subscriber benefits, including permanently unlocking the expansion story content and the current level cap. You'll continue to get all the subscriber perks through the end of the month. It's all very easy to do online, no need to contact support or anything like that. One other minor thing that I had misunderstood: Based on information I'd previously read, I was under the impression that, like excess credits, excess XP was saved, and after you subscribed you would automatically advance to your new level. Nope! All the XP I gained while a non-subscriber at level 50 is lost. 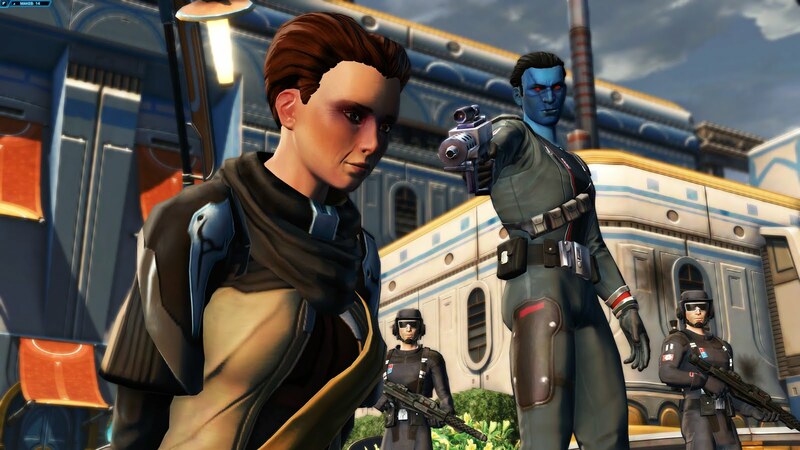 Which is totally not a big deal at all - as always, SWTOR is overly generous with XP grants, and I ended the expansion (which is supposed to be for levels 51-55) at level 67, without any grinding or multiplayer or operations or multiplayer flashpoints or space missions or anything. But if you do care about that, it might be worth doing your one-month subscription starting at level 50 and not at the end of the F2P story content. Okay! I think that's it for nuts and bolts, bytes and dollars. Now into the expansion proper. A whole bunch of stuff gets unlocked with this expansion: new areas, flashpoints, operations, side-quests, game mechanics, and so on. The single biggest addition is probably Makeb, the planet where most of the story missions take place. This is where the titular Hutt Cartel flexes its muscles: Makeb has been independent for some time, has entered into disadvantageous trade agreements with the Hutts, the Hutts (well, at least some of them) are recklessly industrializing and mining the planet's core, and you are called in to try and sort out the planet's problems and bring them into your faction's fold. I was particularly pleased at how the game acknowledges your character's elevated stature. It's tempting for expansions and sequels to hit the reset button and push you into a new culture where nobody knows or cares who you are. Here, though, you've already accomplished great things and are recognized throughout the galaxy, and you are acknowledged as an important asset of the Republic war effort. It's kind of nice to be in that position, where characters will thank you for paying attention to their problems while they worry that they might be keeping you from grander conflicts. It can be tricky to have a high-power campaign where the stakes are still believable, and they did a great job at pulling that off. The actual plot is pretty interesting, I'd say roughly on par with one of the original planetary arcs like Alderaan or Voss. There are some cool layers of plots to dig through, a wide range of minor and major characters, some distinctive cultural elements. There don't appear to be major branching plot lines within the arc, but you get quite a few Light Side / Dark Side decisions along the way, and a significant choice at the end. From a lore perspective, I'm always interested to see corporations depicted within Star Wars; the big players like Czerka have cropped up in the past (and make a bigger appearance later in the expansion), but here we get to see some slightly-smaller-scale businesses, including the individuals who run them. The game doesn't appear to have much of an appetite for critically examining capitalism, which is totally fine, as that's never really been a part of the Star Wars DNA (and is also one of the reasons why The Last Jedi was so nicely shocking). At the very least it's cool to have some flavor outside of the normal lightsabers-and-blasters-and-robes deal, and it does give a venue for you the player (not necessarily you the character) to question why the galaxy is the way it is. At the time of its release, Rise of the Hutt Cartel might have been most anticipated due to its delivery of long-anticipated same-gender romance arcs, or SGRAs. I remember there being a lot of drama around this at the time of the game's initial launch. By this point, BioWare had cemented a reputation as an LGBT-friendly company with a commitment to writing diverse characters, and quite a few players were understandably bummed that all of the romances in the game (a total of nineteen!) were exclusively heterosexual. 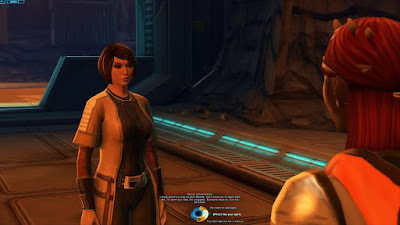 This led into one of the predictably tedious fandom "debates", with a minority arguing that gay people don't exist in the Star Wars universe, and more pointing out that KOTOR already had a lesbian romance with Juhani. The Austin studio seemed much more reserved on the issue than the Edmonton (Dragon Age / Mass Effect), but there were some vague promises that those kind of relationships would appear in the future. At the time I'd been curious if they would do this by editing and expanding existing characters; for example, it seemed odd that female Imperial Agents can't romance Kaliyo, who is canonically bisexual. 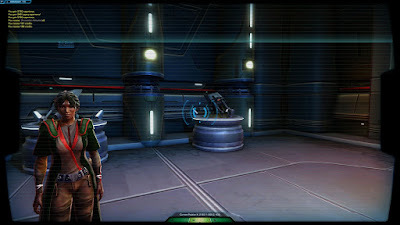 Instead, BioWare opted to add SGRAs for future characters, the first of which are introduced here. That's a minor bummer, as players might need to play through a significant amount of the game before being able to start that content, but I suspect it's a lot simpler and less risky to do this than to mess with stuff already in the game. Up until this point, Trel'ves's only romance option had been the cocky and insufferable Doc, and it was kinda nice to start a little something with Lemda, the daughter of a wealthy CEO and a geologist who has been researching the earthquakes wracking Makeb. The "romance" is very tame: You get a couple of [Flirt] prompts over time, and if you do it often enough, there's a quick but fairly sweet kiss between you two. It's all rather light, but then again, so are the standard romances for class characters: again, this is probably in keeping with Star Wars' lighter tone, and they are firmly PG connections, as opposed to the more PG-13/R ones you can see in the M-rated BioWare games. 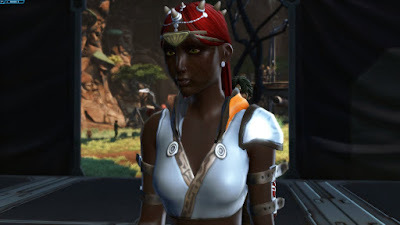 Unlike the companion romances, though, Lemba purely lives on Makeb: she'll never travel with your party or hang out on your ship or whatever. Still better than nothing! Oh: Also worth mentioning here that Makeb is gorgeous, one of the prettiest planets in a game willed with pretty planets. Particularly after the stark and cold beauty of Ilum, I really enjoyed spending time in such a lush and verdant world. While Makeb is the single biggest element of the expansion, it probably accounts for less than half of all the new content unlocked by it. The remaining elements include both new content set on old worlds, and smaller brand-new areas and missions. 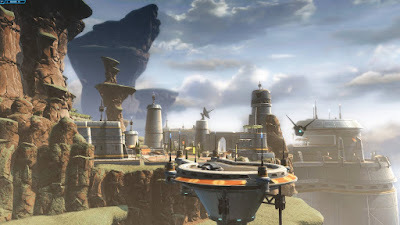 The first of those are two new game modes kicked off from Coruscant, Seeker Droid searches and Macrobinocular landmark identification. Seeker Droids are D U L L. I ran into something similar while searching for HK-51 droid parts, and this is even worse. The idea is that you travel to a planet, then find a zone within that planet, then start searching it for content. There's usually a huge area to search, each search takes, I dunno, maybe 10 seconds or so. The idea is that you get feedback over time so you can gradually narrow in on the right location, but that never seemed to work properly for me, even while using consumables that are supposed to make it more accurate. Once you finally find it, you're done, and move on to the next planet. Macrobinoculars were a lot more fun. You travel to an area, pull out your binoculars (think of the ones Luke used to observe sandpeople in A New Hope), and pan them across the landscape looking for a target. Part of what's cool about this is finding good vantage points: the target is shown on your map, but you might be able to actually spot it from much further away if you find good sightlines. Some targets are easier to find than others, but the hardest of them are still far less frustrating than the seeker droids. What finally crushed my spirit, though, was the way that both of these quests eventually lead into flashpoints that cannot be completed by solo players: they require a full 4-person Flashpoint team. Some of the new Flashpoints have been rebalanced for solo players, but not those ones. I knew that going in, thanks to Swtorista's guide, but it was still extremely disappointing. I'm pretty sure that they're designed as on-ramps for group content: solo players like me will get as far as they can, then be forced to join a group, then discover that they like multiplayer stuff after all and start running operations and become subscribers. But, nah. What's especially annoying about these is that the underlying quests themselves as incredibly solo-oriented: you're basically being a tourist, going to a place and looking at a thing, which is the least group-incentivized activity in the game. It was at this point that I actually decided I'd stop playing. My initial plan had been to sub and then play all the way through to the current endgame, but after spending so much time on those missions and then hitting a wall I'd had enough. I think the final straw came when I attempted one of the Macrobinocular-linked Flashpoints, finally completed a very long and unfun platforming section (yet another game mechanic that SWTOR technically does but does not do especially well), then faced the boss, who, during a very long and challenging battle, knocked me off the edge of the platform and auto-killed me. I realized I was no longer having fun, and hadn't had fun for a while, so I resolved to wrap up the other Hutt Cartel stuff and stop playing as soon as my subscription ran out. But that left three other elements to check out, and fortunately each was better than the one before. CZ-198 was very small, more of a daily area like Section X than anything, but it still felt nice to actually do something again, and it didn't overstay its welcome. Then came Oricon, which was actually quite cool. 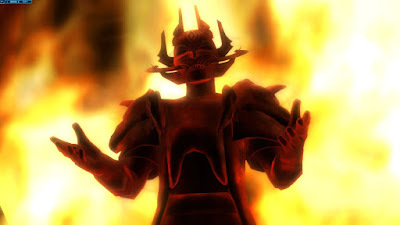 It had a nicely ominous atmosphere, some deep lore, good cut-scenes and a couple of vivid characters. 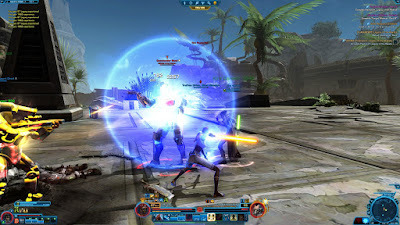 The plot here deals with a group of ancient Sith known as the Dread Masters, who have become another rising faction; on Oricon, they are using their immense telepathic powers to project madness and despair into the minds of their foes, including the Jedi and Republic troopers attempting to establish an outpost here. 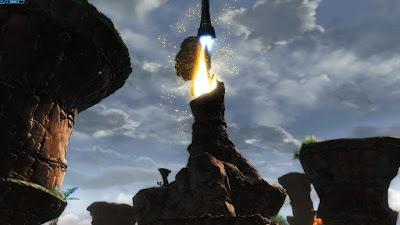 This planet is dramatic: volcanic, with lots of flowing lava and tall, rough rock pillars. Once again the story culminates in group content not available to solo-ers, but this was another place where I felt more or less satisfied by the missions that were available to me. The last part was the best: the Prologue to Shadow of Revan. Somewhat like the False Emperor arc at the end of the original game, here we have a set of Flashpoints that link together to tell a single story. This is where I absolutely have the most fun in SWTOR. They are relatively quick, fairly linear, the combat is challenging, boss fights have unique mechanics, you can see some cool cut-scenes, there are a handful of decisions to make, the stakes feel high, the loot is all good. This new arc depicts a bold plan to destroy the Sith Academy on Korriban, which eventually segues into a conspiratorial plot that shifts attention beyond the Republic and Empire, shines additional light on the Infinite Empire, and ends with the dramatic reappearance of Revan himself. As noted above, I'm suspending my planned full playthrough of SWTOR: I want to get to some of the shiny new games populating my Steam queue, and I've been playing this for a long time. 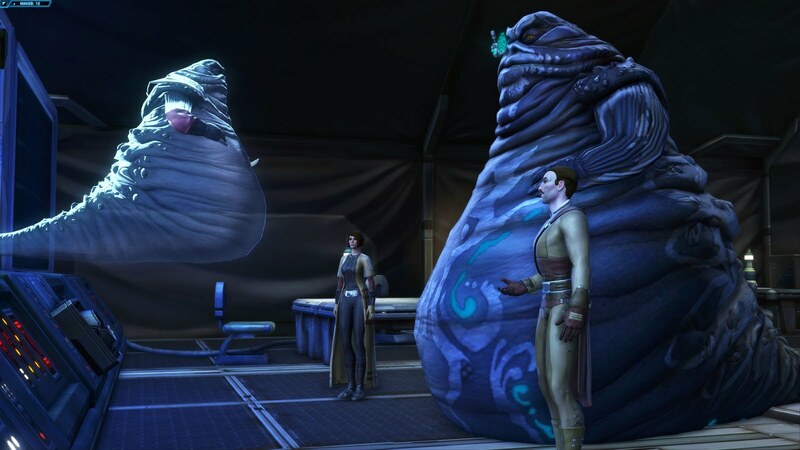 That said, the last few missions of Rise of the Hutt Cartel reminded me of just how much fun this game can be when it's firing on all cylinders, so I still would like to come back. I don't think I can wait for too long, though... more so than many other games, late-stage MMOs require muscle-memory-memorization of tons of hotkeys and macros and such. 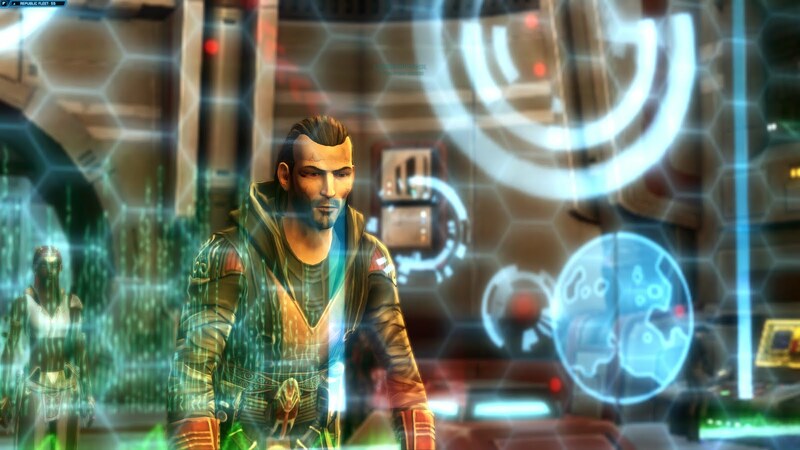 The few times I've loaded up Seberin, my original agent from 2011, I can barely move him at all because I'd optimized his commands so much that none of the standard buttons do what I now expect. But anyways, I remain impressed at the sheer scope and ambition of MMOs like this, and am at least somewhat curious about the plot arcs currently underway. Despite my griping, I do appreciate the efforts BioWare has made to make the game more solo-friendly, and I feel reasonably confident that I'll enjoy what lies ahead if and when I finally return.